Also a can I picked up at Belgium, because it's so unique. However this plastic can already exist for a quite while, but I haven't seen it for years though. I actually bought it in a Chinese Toko in the China Town in Brussels. The taste of this refreshing water is quite good. I really liked the taste of lychee and its not too sweet and very refreshing. 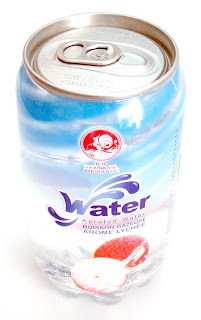 The can uses a shrinkwrap to get the graphics onto the can. What is neat about this, is that you can see how much there is still left in the can instead of normal aluminum cans. Also with plastic you can do more about the shapes easily. And could make a very special shape and give more design in it instead of only the graphics.